Anyway, this is my first Rosebank ever (which perhaps I should be more embarrassed to say than I am). It was bottled by Specialty Drinks (aka the Whisky Exchange) for their Single Malts of Scotland line. Somewhat unusually for this line, it is not from a single cask but a vatting of two bourbon hogsheads. Nose: Heathery sweetness. (Frankly, I have no idea what heather smells like, but you can’t expect to hack it as a whisky reviewer if you don’t find notes of heather in at least 70% of everything you nose.) The slightest bit spirity, but not for long. A little acidity on the edges. Gets a little muskier, a little more malty. Not terribly complex but quite pleasant. With time the acidity expands and a nice fruitiness emerges: kiwi? gooseberry? lime? I think this can handle some water; let’s see if that does anything interesting: ah, a touch of water doesn’t really bring any new aromas—well, maybe a little vanilla—but it does make everything more balanced, I think. The vanilla notes come to the fore with time; there may even be some butterscotch–more biscuity, at any rate (in the British/Indian, not American sense). Palate: Nice mouthfeel. A lot more acidic on the palate than on the nose at first: lime cordial, champagne vinegar. With time the acidity mellows and things get a little more malty, and also a little bit grassy. With water, the lime cordial gets spiked with some apple juice. The grassy note seems to expand at first but after some time the palate settles down into a pleasant, mildly fruity, mildly acidic sweetness. Finish: Long, but not aggressive. The acidity lingers and then some wood spice shows up at the end. More bitter with water, but nothing unpleasant. Comments: At first I thought this was going to be just okay but with time it got more interesting (and with water the nose, in particular, improved a lot). And I liked it a lot more a day later on my second pour than on my first. An aperitif whisky–though given the acidity it might even go nicely with some cheese after a meal. Not perhaps the blockbuster Rosebank that a Rosebank fan would have picked as my first Rosebank, but it does make me curious to try others. I will say that I don’t think this is a triple-distilled whisky, or at least that if it is, it seems like it could just as easily have been double-distilled; and also, that this could pass quite uncontroversially as an en-bourbon Speysider. Rating: 86 points (was between 83 and 84 on my first go-around). 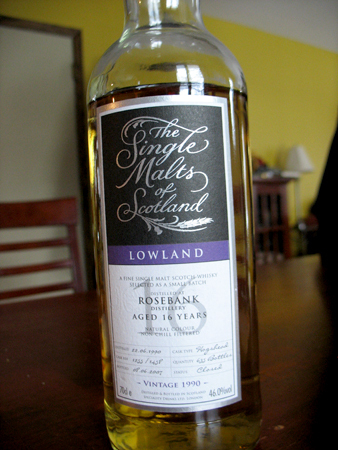 This entry was posted in -Whisky by Rating, 85-89 points, Rosebank, The Whisky Exchange, Whisky by Bottler. Bookmark the permalink. I’ve picked up a couple of the Diageo Special Release bottles (the 21 year old) and the label notes that it was triple distilled. 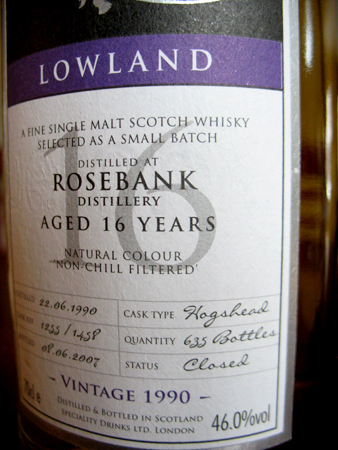 Now this was also made in 1990 so I’m not sure either whether there was any change between then and closing but I’m inclined to believe Rosebank always triple distilled. Incidentally, is there really any way to taste that third distillation? Having tried a few triple distilled Irish whiskies and an Auchentoshen, I can’t really taste a difference. I associate triple-distillation with a creamy smoothness, but as to whether I actually taste/sense more creamy smoothness in triple-distilled whiskies or find it because I think I should, I don’t know. Without the benefit of the bottle I could not get past the initial impression, which was similar to yours: somewhat hot, oaky (and okay), a little acidity, and not much else. Unlike the delicate and elegant Rosebanks I had. The nose hints at some of those goods. So, much closer to your initial 83 for me than to your ultimate 87. Thanks for the sample! Good to read your thoughts on samples of whiskies I reviewed a while ago (this one was when the blog was just a couple of weeks old). If you want I can send you another sample of this in our next swap—you can then see if you note any greater nuance with time/air. I’m having fun with them too. I’m clearing the deck of samples, some of them from last year. I’ll be on the lookout for the famous old sample effect!